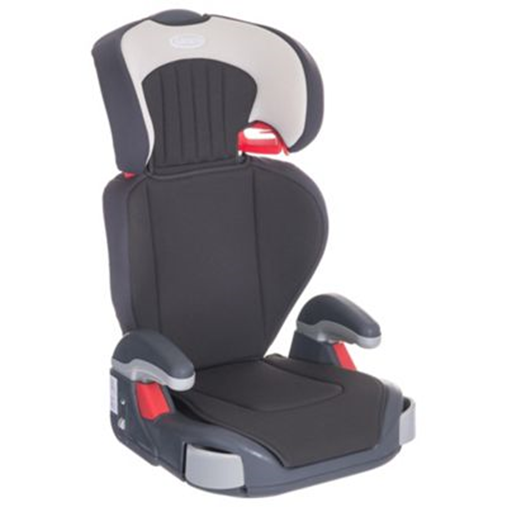 I bought a car seat for my 5 year old daughter at the weekend and like most buyers, I started with Google. Tap, tap, tap. I review the options and filter by Average Rating and I breezily trust the reviews of 257 people I have never met with my daughters car safety. By the time I walk into my local store I feel informed, I've made my choice and I'm ready to purchase. The conversation with the in-store sales rep is now about price and availability - not value. According to IDC, 70% of adults trust the recommendations of the peers and networks on social media compared to only 15% who trust brands. The trust economy is a transparent world powered by referrals and digital word of mouth. It's that place where contacts and connections are the new currency. Whether B2B or B2C, buyers are digitally informed and totally in control of their own buying journey. They no longer rely on tender processes to educate and inform them. They use the internet and their network to learn, shortlist and communicate. The social savvy buyer is forcing organisations to change the way they do business with them. Why Is The Employee Voice So Trusted? At the end of the day, people want to talk to people, not logos. 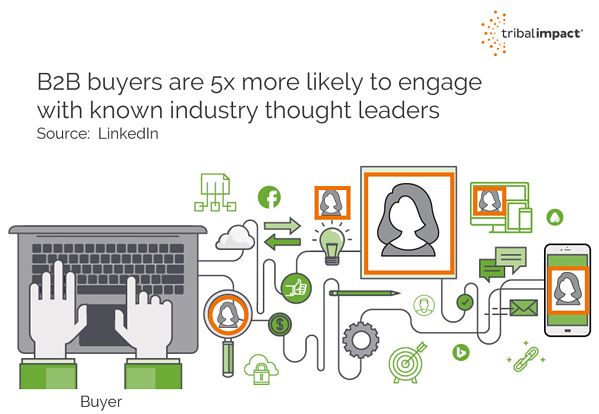 According to LinkedIn, B2B buyers are 5x more likely to engage with known industry thought leaders - your experts! 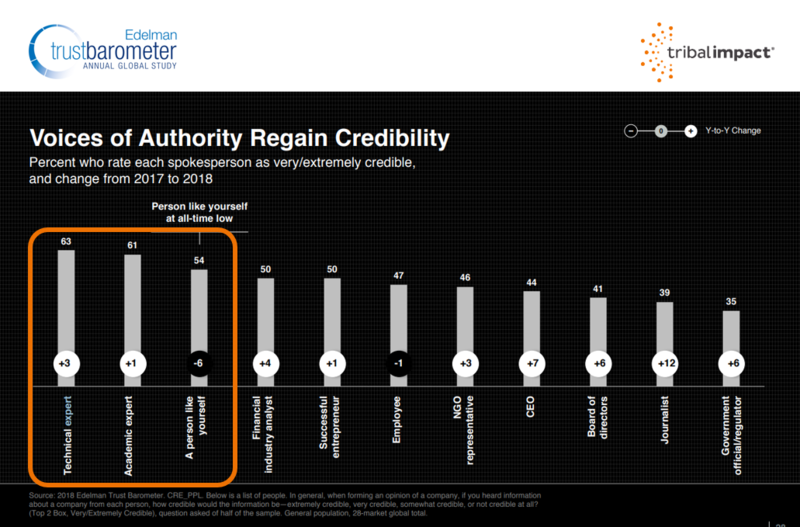 This is backed up by data from the Edelman Trust Barometer which shows that experts and peers are still trusted more than leaders and logos. Tapping into the trusted economy starts with the trusted voice of your employees. They are most closely connected to your brand and arguably, the most closest connected to your customers. At a time when 74% of buyers choose the company that was first to add value to their buying decision, it's more important than ever to activate the expert voice of your employee community. Quite simply, it's about putting your employee expertise in front of your logo. It's about enabling (and trusting - not always easy!) your employees to become the authentic voice of your brand. But this isn't just exploiting the reach of your content through the networks of your employees on social media. It's about connecting the dots across your organisation and enabling them to get active on social media in a way that suits them and their role. The Benefit Of Activating Employees On Social Media? After years of telling our employees to avoid using social media and risk diluting the brand message, companies are starting to embrace and empower the human side of B2B marketing. Activating the employee voice is beneficial for both brand and employee. Consider this. For years we've been telling our employees not to be active on social media for fear that uncontrolled brand messages fly around the internet. Now we flick a switch and say "off your go" with little guidance or enablement. 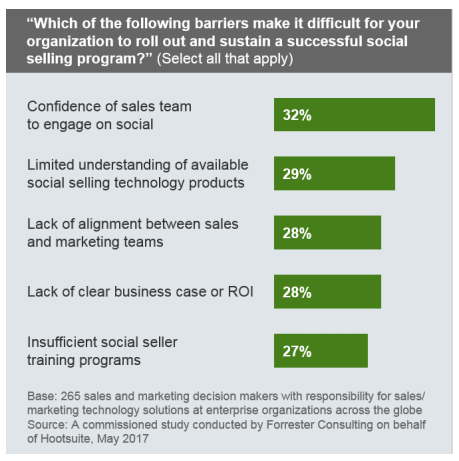 According to Forrester, 27% of enterprises said that lack sufficient training programs made it even more difficult to instil social selling confidence in their teams. Some employees will embrace the freedom. Many will be sceptical of the sudden shift in policy. Segment your employees as you would segment buyers. For example, an account manager will want to know how social media will help increased his/her pipeline and enter the buying cycle earlier. A company leader will want to understand how it will help drive revenue growth and improve employee engagement. Make sure you can answer the WIIFM question - what's in it for me! Each employee will be starting their social journey from a different point. Some will be more advanced than others. Recognise your social heroes and your social zeros and align training needs accordingly. Just to add to the complexity, people learn in different ways. Once you done this, explain transparently why the company is encouraging social activity and what's in it for them as employees. Once you understand motivations, this won't be hard to do. Don't assume all of your employees are ready to move from social zero to social hero. This isn't about creating an army of bloggers within your business. It's about identifying who wants to get involved and in what capacity. Naturally, some creators will also be sharers. These aren't strictly defined but we notice that as employees become more confident on social media, they shift their behaviour in alignment with these roles. 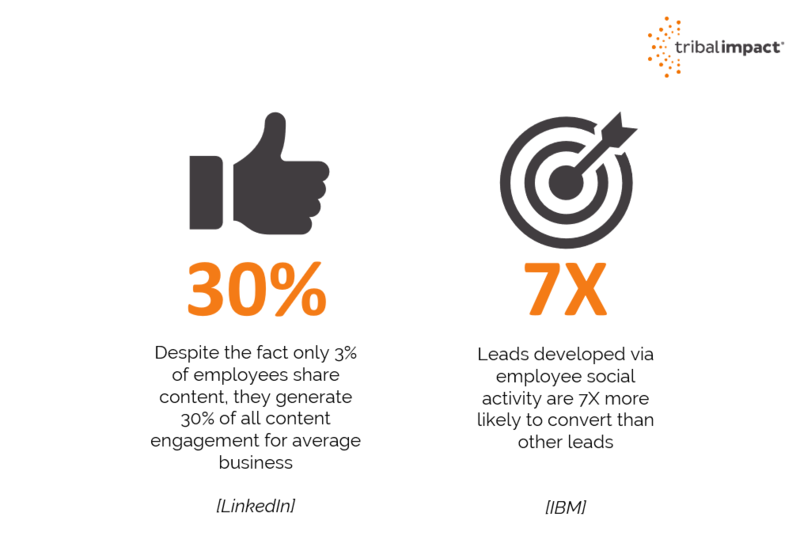 Despite the fact that only 3% of employees share content, they generate 30% of all content engagement for average businesses (LinkedIn) and leads developed via employee social activity are 7x more likely to convert than other leads. It's such an exciting time to be in B2B Marketing. We're using data to better understand our buyer journey. We're starting to realise we need to be less sales driven and more buyer centric. "Smile and dial. Pounce and pitch. Show up and throw up. We need to be reaching and teaching." Marketers are well positioned to drive this human shift in the way we do business. 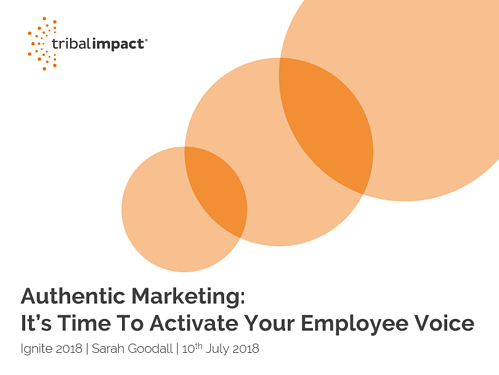 By activating the employee voice on social media we create relevant content, we increase the reach of that content (because our employees want to share peer content) and we build relationships at scale based on trust and authenticity. I firmly believe this. Do you? How is your organisation embracing the trusted economy?